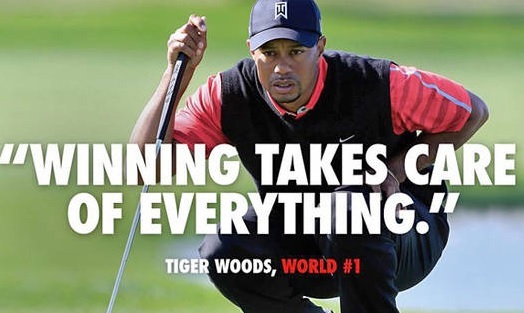 Not everyone has forgiven Tiger, as this controversy makes clear. And no one would suggest that his recent string of success somehow absolves him of his personal failings.But the fact is that athletes are ultimately judged on performance, and barring a truly career-ending scandal — Oscar Pistorius’ murder charge or Lance Armstrong’s admission of doping, for instance — they can always get back in our good graces by performing well on the field.Nike probably shouldn’t have come right out and said so in their ad. And to be fair, the quote in question was initially uttered by Woods when he was asked whether he was preoccupied with his ranking.